A grand celebration is scheduled in a little over one year when the American Brush Manufacturers Association (ABMA) 100th Annual Convention convenes. The event is set for March 22-25, 2017, at the Hyatt Regency Grand Cypress, in Orlando, FL. Plans for this extravaganza have been in the works since 2009. The Hyatt Regency Grand Cypress’ location is adjacent to Walt Disney World, making it ideal for additional entertainment options, he added. “An appropriate venue for the 100th anniversary celebration has been selected, and many people connected with ABMA are hard at work making plans for the event itself. We welcome everyone connected to the industry, past and present, to attend our 100th annual convention,” Parr said. Prior to the festivities in 2017, ABMA will hold its 99th annual convention on March 2-5, 2016, at The Hyatt Regency Coconut Point Resort & Spa, in Bonita Springs, FL. Visit www.abma.org for more information. A long anticipated documentary about the brush industry will be released during the 2017 celebration. “One of the primary focuses of this milestone anniversary was to create a video piece that celebrated the love we all have for this industry — its vibrancy, creativity, health and staying power,” Parr said. “The documentary is for ABMA members, their customers, their employees and anybody from a wider audience who might have an interest in this industry. As we’ve been putting it together, we have all become even more attached to the industry and its people. There are few industries where companies come together like we do; where competitors buy from each other and help in times of need. We are a very special group, and we hope the documentary conveys this message appropriately. 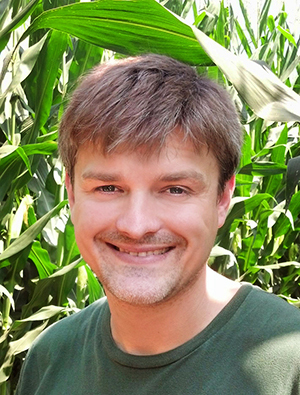 Chris Monahan, of Brush Fibers, Inc., in Arcola, IL, chairman of the ABMA Production Committee in charge of the documentary, added that final video editing continues. “We want to give as many ABMA members as possible the chance to be interviewed and share their stories. Our committee is working closely with documentary director Robin Peters, as well as David Parr, to oversee all aspects of the video," Chris Monahan said. Parr credits members of the ABMA 100th Anniversary Task Force for playing key roles in the planning and development of the entire centennial celebration. “The Task Force has been the driving influence behind the whole event. Its members have volunteered countless hours over the past six years to bring their ideas to fruition,” Parr said. “From fundraising, event planning, strategy sessions, documentary creation and editing, to the convention itself, members of the Task Force have worked diligently behind the scenes in every facet of planning and execution. As of early 2016, there is work that still needs to be done, Parr added. This includes finishing edits to the documentary. “Our Board had its first peek at the documentary in November, and we have received a lot of feedback; so there is still work to be done. We also have speakers and entertainers to contract with, in addition to working on site preparations,” Parr said. He noted that it’s special when an association gets to celebrate 100 years. This achievement is testament to ABMA’s membership over the years and the industry itself. “As executive director, I get to see a wide variety of industry connections take place. I spend a lot of time connecting companies with suppliers, inventors with potential manufacturers and helping companies solve everyday problems. I’ve been in this industry since 1981, and for as much time that has passed and the many changes I’ve seen, the one constant is the strong fraternity that exists within this industry,” Parr said. “There are many great friendships in the brush industry and many people who work tirelessly to make other people’s lives better. This includes co-workers, competitors, the communities in which they live and the industry as a whole. Monahan agreed that the centennial celebration should be special. Monahan added that the initial role of the ABMA 100th Anniversary Task Force was fundraising, and it has greatly benefited from many capable volunteers who share a high level of passion and sense of industry history and family. ABMA President Mark Fultz, of Abtex Corporation, in Dresden, NY, and ABMA Past President Jeff Malish, of The Malish Corporation, in Willoughby, OH, are also looking forward to the 100th anniversary celebration in 2017. “For the past six years, members of the ABMA 100th Anniversary Task Force have made it their mission to create, not only an unforgettable celebratory convention, but also a memorable tribute to the brush industry,” Fultz said. “Regardless of how much you think you know about brushes, you will walk away from the 100th anniversary celebration with a new found respect for the importance of brushes in almost every facet of our lives. The group comprising the Task Force has done an unbelievable job. U.S. government trade figures for the first nine months of 2015 indicate raw material imports were up in three categories outlined: hog bristle, broom and mop handles and brush backs, compared to the first nine months of 2014. For September 2015, three categories outlined reported increases, hog bristle, brush backs and metal handles, compared to September 2014. Import totals for the first nine months of 2015 were up in six finished goods categories outlined: brooms and brushes of vegetable materials, toothbrushes, hairbrushes, paint rollers, paintbrushes and upright brooms, compared to the first nine months of 2014. In September 2015, four categories outlined recorded decreases: brooms of broom corn valued at more than 96 cents, toothbrushes, shaving brushes and paintbrushes, compared to September 2014. The United States imported 36,772 kilograms of hog bristle in September 2015, up 320 percent from 8,747 kilograms imported in September 2014. During the first nine months of 2015, 195,717 kilograms of hog bristle were imported, up 1 percent from 193,543 kilograms imported during the first nine months of 2014. China sent 192,124 kilograms of hog bristle to the United States during the first nine months of 2015. The average price per kilogram for September 2015 was $25.43, down 4 percent from the average price per kilogram for September 2014 of $26.53. The average price per kilogram for the first nine months of 2015 was $20.53, up 41 percent from the average price per kilogram of $14.56 for the first nine months of 2014. The import total of broom and mop handles during September 2015 was 1.3 million, down 7 percent from 1.4 million for September 2014. During the first nine months of 2015, 14 million broom and mop handles were imported, up 4 percent from 13.4 million for the first nine months of 2014. During the first nine months of 2015, the United States received 8.1 million broom and mop handles from Brazil, 3.1 million from Honduras and 1.9 million from China. The average price per handle for September 2015 was 95 cents, up 1 cent from the average for September 2014. The average price for the first nine months of 2015 was 96 cents, up 4 percent from 92 cents for the first nine months of 2014. September 2015 imports of brush backs totaled 712,651, up 63 percent from 438,087 for September 2014. During the first nine months of 2015, 5.3 million brush backs were imported, up 10 percent from 4.8 million for the first nine months of 2014. Canada sent 2.6 million brush backs to the United States during the first nine months of 2015, while Sri Lanka shipped 1.9 million. The average price per brush back was 41 cents during September 2015, down 1 cent from the average price for September 2014. For the first nine months of 2015, the average price per brush back was 45 cents, the same as the average price for the first nine months of 2014. The import total of metal handles during September 2015 was 2.6 million, up 18 percent from 2.2 million for September 2014. During the first nine months of 2015, 20.5 million metal handles were imported, down 12 percent from 23.2 million for the first nine months of 2014. During the first nine months of 2015, Spain exported 9.3 million metal handles to the United States, while China sent 8.6 million and Italy shipped 1.9 million. The average price per handle for September 2015 was 85 cents, the same as the average price for September 2014. The average price for the first nine months of 2015 was 99 cents, up 16 percent from the average price for the first nine months of 2014 of 85 cents. The United States imported 560,799 brooms of broom corn valued at more than 96 cents per broom during September 2015, down 17 percent from 672,103 for September 2014. During the first nine months of 2015, 5.6 million brooms of broom corn were imported, down 8 percent from 6.1 million for the first nine months of 2014. Mexico shipped 5.5 million brooms to the United States during the first nine months of 2015. The average price per broom for September 2015 was $2.45, down 2 percent from $2.50 for September 2014. The average price per broom for the first nine months of 2015 was $2.55, up 2 percent from the average price for the first nine months of 2014 of $2.51. The import total of brooms and brushes of vegetable material during September 2015 was 623,804, up 141 percent from 258,528 brooms and brushes imported during September 2014. During the first nine months of 2015, 4.8 million brooms and brushes were imported, up 167 percent from 1.8 million for the first nine months of 2014. 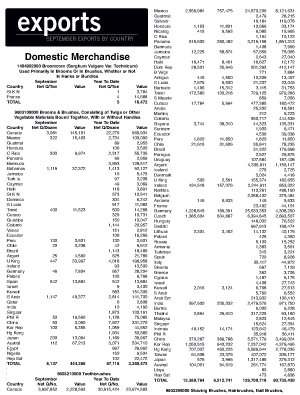 Sri Lanka exported 1.7 million brooms and brushes to the United States during the first nine months of 2015, while Canada sent 1.3 million and China shipped 1.2 million. The average price per unit for September 2015 was 94 cents, down 11 percent from the average price for September 2014 of $1.06. The average price for the first nine months of 2015 was 98 cents, down 31 percent from the average price for the first nine months of 2014 of $1.43. The United States imported 87.1 million toothbrushes in September 2015, down 7 percent from 93.9 million imported in September 2014. During the first nine months of 2015, 782.8 million toothbrushes were imported, up 3 percent from 757 million imported during the first nine months of 2014. China sent 597.3 million toothbrushes to the United States during the first nine months of 2015. The average price per toothbrush for September 2015 was 23 cents, down 8 percent from the average price for September 2014 of 25 cents. The average price for the first nine months of 2015 was 24 cents, the same as the average price for the first nine months of 2014. September 2015 imports of hairbrushes totaled 4 million, up 54 percent from 2.6 million for September 2014. During the first nine months of 2015, 33.3 million hairbrushes were imported, up 28 percent from 26 million for the first nine months of 2014. China shipped 33.1 million hairbrushes to the United States during the first nine months of 2015. The average price per hairbrush was 27 cents during September 2015, down 10 percent from 30 cents for September 2014. For the first nine months of 2015, the average price per hairbrush was 25 cents, down 7 percent from the average price for the first nine months of 2014 of 27 cents. The United States imported 7.6 million shaving brushes in September 2015, down 47 percent from 14.4 million imported in September 2014. During the first nine months of 2015, 64.6 million shaving brushes were imported, down 23 percent from 84.4 million imported during the first nine months of 2014. China sent 34.6 million shaving brushes to the United States during the first nine months of 2015, while Germany shipped 22.9 million. The average price per shaving brush for September 2015 was 14 cents, up 40 percent from the average price for September 2014 of 10 cents. The average price for the first nine months of 2015 was 11 cents, up 1 cent from the average price for the first nine months of 2014. The import total of paint rollers during September 2015 was 5.1 million, the same as September 2014. During the first nine months of 2015, 52.9 million paint rollers were imported, up 31 percent from 40.3 million during the first nine months of 2014. China sent 43.7 million paint rollers to the United States during the first nine months of 2015, while Mexico exported 5.2 million. The average price per paint roller for September 2015 was 57 cents, up 21 percent from the average price for September 2014 of 47 cents. The average price for the first nine months of 2015 was 52 cents, up 4 percent from the average price for the first nine months of 2014 of 50 cents. U.S. companies imported 20 million paintbrushes during September 2015, down less than 1 percent from 20.1 million paintbrushes imported during September 2014. Paintbrush imports for the first nine months of 2015 were 192.4 million, up 12 percent from 171.1 million recorded for the first nine months of 2014. China shipped 181.8 million paintbrushes to the United States during the first nine months of 2015, while Indonesia sent 8.6 million. The average price per paintbrush for September 2015 was 34 cents, up 6 percent from the average price for September 2014 of 32 cents. The average price for the first nine months of 2015 was 33 cents, up 10 percent from 30 cents for the first nine months of 2014. The total import of upright brooms for September 2015 was 1.3 million, up 8 percent from 1.2 million for September 2014. During the first nine months of 2015, 11.5 million upright brooms were imported, up 4 percent from 11.1 million imported during the first nine months of 2014. China sent 9.8 million upright brooms to the United States during the first nine months of 2015. The average price per broom for September 2015 was $1.55, up 17 percent from the average price for September 2014 of $1.32. The average price per broom for the first nine months of 2015 was $1.43, down 8 percent from $1.55 for the first nine months of 2014. Export totals for the first nine months of 2015 were up in three categories outlined: brooms and brushes of vegetable materials, shaving brushes and artist brushes, compared to the first nine months of 2014. In September 2015, three categories outlined reported decreases: toothbrushes, artist brushes and paintbrushes, compared to September 2014. The United States exported 8,137 dozen brooms and brushes of vegetable materials during September 2015, up 66 percent from the September 2014 total of 4,898 dozen. Exports of brooms and brushes of vegetable materials during the first nine months of 2015 were 67,118 dozen, up 35 percent from 49,770 dozen for the first nine months of 2014. The United States sent 22,279 dozen brooms and brushes to Canada during the first nine months of 2015. The average price per dozen brooms and brushes was $54.60 in September 2015, up 40 percent from $39.06 for September 2014. The average price per dozen brooms and brushes for the first nine months of 2015 was $50.07, up 24 percent from $40.45 for the average price per dozen for the first nine months of 2014. During September 2015, the United States exported 13.4 million toothbrushes, down 57 percent from the total recorded in September 2014 of 30.9 million. During the first nine months of 2015, 126.7 million toothbrushes were exported, down 1 percent from 128 million exported during the first nine months of 2014. The United States exported 30.6 million toothbrushes to Canada, 25.5 million to Germany and 24.6 million to Mexico, during the first nine months of 2015. The average price per toothbrush for September 2015 was 49 cents, up 113 percent from 23 cents for September 2014. The average price per toothbrush for the first nine months of 2015 was 48 cents, up 12 percent from 43 cents for the first nine months of 2014. The United States exported 1.8 million shaving brushes during September 2015, up 81 percent from 992,012 shaving brushes exported for September 2014. During the first nine months of 2015, 13.1 million shaving brushes were exported, up 24 percent from 10.6 million for the first nine months of 2014. Brazil imported 4.4 million shaving brushes from the United States during the first nine months of 2015, while Canada received 3.7 million and Mexico imported 1.9 million. The average price per shaving brush for September 2015 was $1.08, down 32 percent from the average price for September 2014 of $1.59. The average price for the first nine months of 2015 was $1.11, down 19 percent from $1.37 for the first nine months of 2014. September 2015 exports of artist brushes totaled 991,351, down 10 percent from the September 2014 total of 1.1 million artist brushes. During the first nine months of 2015, 9.2 million artist brushes were exported, up 11 percent from 8.3 million for the first nine months of 2014. Canada received 5.8 million artist brushes from the United States during the first nine months of 2015, while the United Kingdom imported 618,217. The average price per artist brush was $2.39 during September 2015, up 5 percent from the average price for September 2014 of $2.27. For the first nine months of 2015, the average price per artist brush was $2.41, down 6 percent from the average price for the first nine months of 2014 of $2.56. The export total of paintbrushes during September 2015 was 96,019, down 37 percent from 151,228 for September 2014. During the first nine months of 2015, 1.2 million paintbrushes were exported, the same as the first nine months of 2014. Canada imported 555,272 paintbrushes from the United States during the first nine months of 2015, while the United Kingdom received 239,927. The average price per paintbrush for September 2015 was $13.90, down 2 percent from $14.18 for September 2014. The average price for the first nine months of 2015 was $12.61, down 22 percent from $16.15 recorded for the first nine months of 2014. In 2015, Algoma Mop, in Algoma, WI, was contacted by a prop master who works for 20th Century Fox asking if the company could provide some custom mops for a movie that was going into production. That movie was “JOY,” the story of a family across four generations, and the woman, Joy Mangano, one of America's most successful entrepreneurs who invented the Miracle Mop, and rose to become founder and matriarch of a powerful family business dynasty. 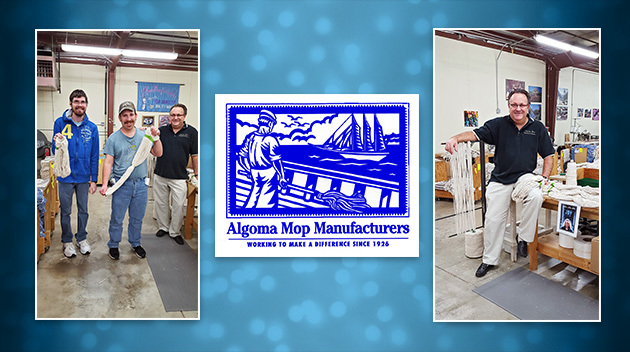 During production, Algoma Mop not only provided the prop master with over 500 mops in various stages of production, but also large bales of yarn and metal-fabricated, hand-operated, mop looping work stations. Algoma Mop contracted with Olson Fabrication, of Algoma, to create parts used in the production of these machines. Some scrap yarn pieces and cotton dust bunnies were also sent to get the full effect of a mop manufacturing floor. The movie features Jennifer Lawrence, who is an Academy Award Best Actress Nominee for her performance as Joy Mangano, Bradley Cooper and Robert De Niro. The producer is David O. Russell, known for “Silver Linings Playbook” (2012), “American Hustle” (2013), and “Three Kings” (1999). Algoma Mop Manufacturers is owned by East Shore Industries, Inc., and is a nonprofit community rehabilitation organization. Visit www.algomamop.com for more information. Abtex Corp., a manufacturer of brush/machine deburring solutions for the manufacturing industry, has promoted Damian Clemens to Systems Group Manager. “Clemens joined Abtex last year when his company, Nihmble Technologies, was acquired by Abtex. The Nihmble Technologies acquisition accelerated Abtex’s growth in the design and production of robotic systems for manufacturing, systems integration, and process control, and helped make Abtex a leader in deburring systems solutions,” according to Abtex. Clemens now oversees the design and development of all Systems Group technologies, which include traditional brush/machine deburring solutions as well as robotic systems. “Nearly all of Abtex’s deburring systems are customized for automotive, aeronautics, and medical-equipment manufacturers." Abtex Corporation, of Dresden, NY, has been providing integrated brush/machine deburring solutions to the North American manufacturing industry since 1980. 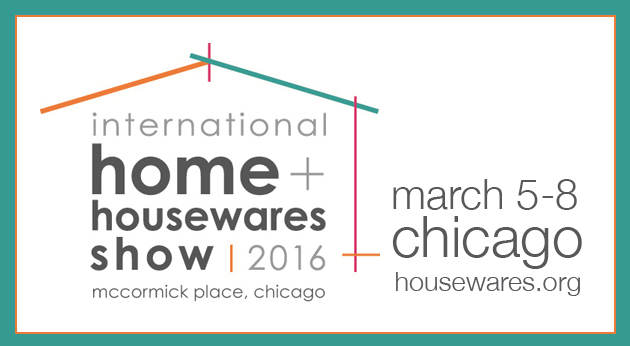 Turning supermarket shoppers into housewares buyers, how millennials shop, color and design trends, and consumers’ mindset about color will be the subjects addressed in the keynote educational sessions at the 2016 International Home + Housewares Show, scheduled for March 5-8 at Chicago’s McCormick Place. These session are scheduled to be held in the Grand Ballroom/S100 of the South Building, and are free to all show attendees. Speakers include Todd Hale, of Nielsen; Warren Shoulberg, editorial director, and Maureen Azzato, chief marketing officer, HFN; color forecaster Leatrice (Lee) Eiseman, executive director of the Pantone Color Institute and director of the Eiseman Center for Color Information and Training; and Tom Mirabile, senior vice president, global trend and design at Lifetime Brands, Inc.
“Hale and his panel will provide an understanding of the major shopper segments of kitchenware. The kitchen category must be merchandised adjacent to the fresh aisle in order to capture more basket fill related to consumer health and wellness. A simple change of how retailers view this category, such as labeling it ‘food prep’ rather than ‘kitchenware,’ can make a difference in what retailers buy and how suppliers go to market,” said a press release from the show sponsors. At noon on Sunday, March 6, HFN editors Maureen Azzato and Warren Shoulberg will use consumer research to present information about how the housewares industry needs to change to address millennials in select specific product classifications. Following the research presentation, a panel of retailers and vendors will discuss the subject. Tom Mirabile, IHA’s trend expert, will offer information into this consumer group, in his seminar at 7:30 a.m. on Monday, March 7. At noon on Monday, March 7, IHA’s color/design forecaster, Leatrice (Lee) Eiseman, will demonstrate where the trends are coming from and where they are going in the future. Eiseman will explain each palette and its guidelines for finding the appropriate comfort zone within the future forecasts. 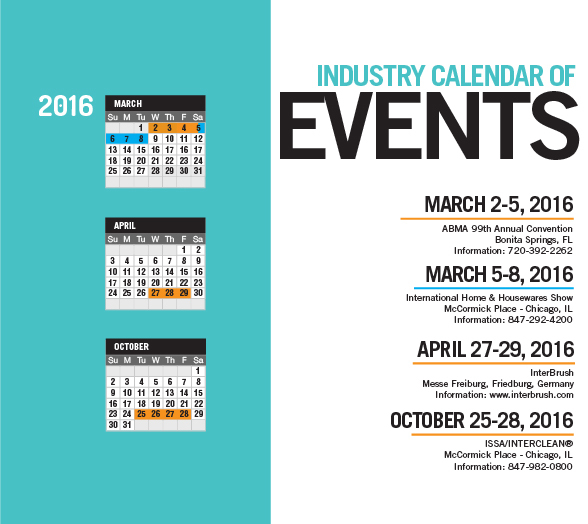 The 2016 International Home + Housewares Show expects more than 2,100 exhibitors and 62,000 attendees. The show opens at 10 a.m. Saturday, March 5, and closes at 3 p.m. on Tuesday, March 8. Visit www.housewares.org for more information. RVers can also continue to access Club Shine accounts through the site, as well as explore items for their boats and vehicles. Photos and descriptions, along with customer reviews, allow users to better understand the products they are purchasing. 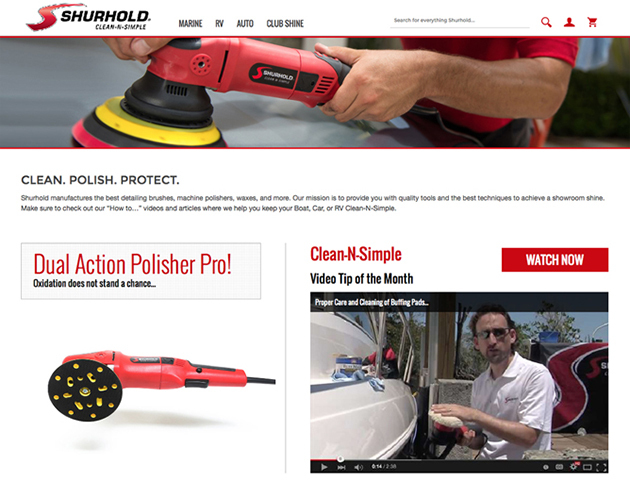 The company manufactures specialty care items and accessories to clean, polish and detail.